More Mandolin Retreats for 2019 will be announced VERY soon! Please come back in a day or so or subscribe to the Newsletter. While Simon has never had time to commit to individual tuition he has put considerable energy into group mandolin workshops. He has taught at numerous international festivals including the Classical Mandolin Society of America, the Goderich Celtic Roots Festival (Ontario, Canada) and the International Guitar Symposium (Iserlohn, Germany). He also teaches regularly in the UK at The National Centre For Folk Arts (Halsway Manor, Somerset) and at his own Mandolin Retreats. 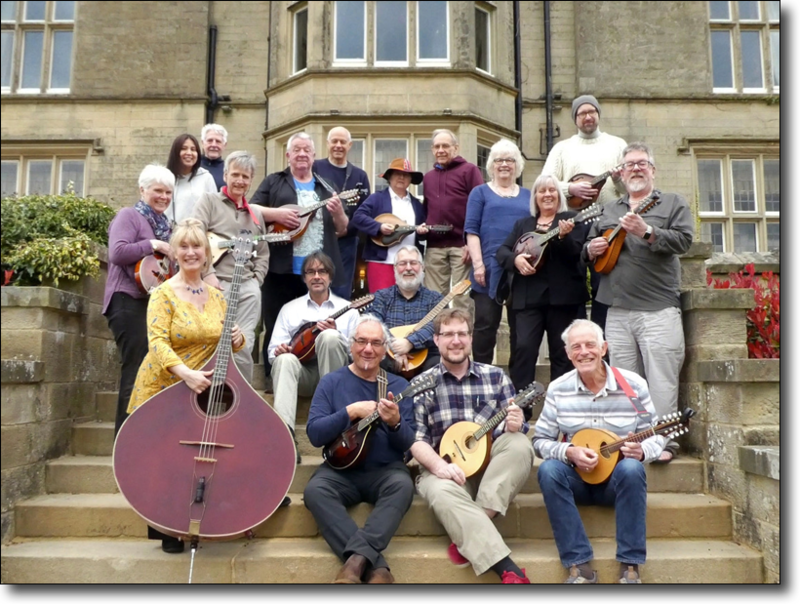 This longer, four day stretch of mandolin immersion in the heart of the beautiful Yorkshire Dales attracted an international array of players. ‘This was my fourth Mandolin retreat with Simon. The Falcon Manor hotel was a perfect venue, especially as we were able to fill the hotel. The excellent rooms and food were enhanced by the very friendly and helpful staff who made each of us feel so welcome. The group gelled quickly together and old friendships were rekindled and new ones formed. Participants came from across the country as well as visitors from Texas and Spain. It was centred on the usual mixture of genre and styles fully supported by Simon’s excellent and enjoyable teaching of techniques. However, spending four days rather than the two on previous retreats, created a more relaxed and supportive learning experience. Regardless of the level of the ability of each individual, there was something new to learn every morning. The afternoon sessions with input from Simon and Hilary on song accompaniment, mandolin building from Mike Vanden, and a history of Mandolin orchestras from Paul Sparks added to a deeper understanding of aspects of our favourite instrument. Phil Nixon, an experienced bass guitarist, talks with Bill Buckley on Radio Berkshire about becoming a beginner mandolinist at Simon’s Mandolin Retreat. My preference is to teach through tunes, discussing matters of technique as they crop up. I cover basic right and left hand positions, tremolo, position shifts, playing in closed positions, use of the plectrum and tone production, improvisation, and much more. My aim is to de-mystify the mandolin as much as possible, whether that be finding your way around the neck, or understanding some of that dreaded music theory! 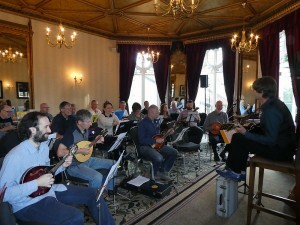 The Retreats are also a great opportunity to meet like-minded people and to learn to play as an ensemble. So while some tunes will be melody only, some will be arranged in parts specifically for ensemble playing; I always try to make one part very simple so the less experienced players will still be able to contribute. Music (in both standard notation and tablature) and MP3 sample files is sent out well in advance so you can acquaint yourself with the tunes. Don’t in any way think that you need to learn them all note-perfect before you come. Above all, the Retreats are meant to be a fun, relaxing time, and the amount of preparation you put in is entirely up to you – there will be no exam! Having said that, at all workshops I’ve hosted we’ve all been delighted at what a great sounding mandolin orchestra we’ve had by the time things wind up. The approach will not be geared to any one musical genre; I try to make it as general as possible. And by the way, I’m very happy for you to make audio recordings of the sessions. This varies a little depending on the event; you’ll need to read the synopsis for the particular Mandolin Retreat you’re interested in. Generally, you’ll need a reasonable knowledge of how to read either mandolin tablature (easy) or standard music notation (a steeper learning curve), and the ability to get from start to finish of a simple tune without stumbles. For less experienced players I often create a particularly easy part in ensemble pieces. Music and sound files are sent well in advance. If you play any other instruments from the mandolin family (mandola, mandocello, octave mandolin, luito cantabile – or even mandobass) you’re welcome to bring them too. The ensemble playing in workshops can benefit hugely from the inclusion of some of the mandolin’s lower-pitched relatives, and occasionally a guitar. You can let me know in advance if you’d like the music in bass clef or transposing tablature. Simon and Hilary often play a public concert on one evening. Entrance is always free to those attending the workshop. To be announced for future Mandolin Retreats. If you’ll be attending as a couple and sharing a room and would like a special rate, or if you’d like to bring a spouse or friend who will be sharing your room but not attending the course, or if you have any other questions please use the contact form.